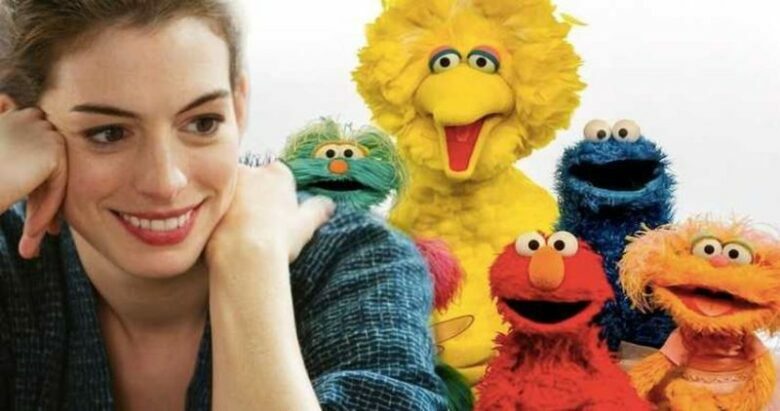 There has be reported that the producers of Sesame Street Movie are trying to get Anne Hathaway for the lead role in the movie. Portlandia co-creator, Jonathan Krisel, will be the director, and the movie will be make by Warner Bros. This musical project will bring all of the beloved characters from the iconic kids series together on the big screen. Chris Galleta is writing the script for it. It is reported that the Academy Award winning actress, Anne Hathaway, is the studio’s first choice for starring next to the Big Bird, Oscar the Grouch and Cookie Monster. Two movies Hathaway starred in, The Dark Knight Rises and Ocean’s 8, were both made by Warner Bros. Also, she had a lead role in musical Les Miserables, where she showed us she can sing. You will be able to seen her in the upcoming thriller Serenity too. In 1985, with Sesame Street Presents Follow That Bird, and in 1999 with Elmo in Grouchland, Sesame Street appeared on the big screen, this movie would be the third one. The show first premiered in 1969, and after 45 years on the PBS, it moved to HBO. First thoughts about making this kind of a show appeared in 1966, when television producer Joan Ganz Cooney and Carnegie Foundation vice president Lloyd Morrisett wanted to do something positive with capitalizing the power of TV. Newly formed Children’s Television WorkShop (CTW) received grant of $8 million to create Sesame Street. The show was the hit from the beginning, and the first one of that kind to use formal and laboratory research, so it had a teaching background. After 40 years of airing, it was broadcasted in over 120 countries. In 2016, Sesame Street and HBO came up with an idea of making another movie, after their five-year development deal started. Beside production team being in negotiations with Anne Hathaway, nothing else is known about movie, nor story, nor who else will star. The first to announce the news about casting Anne Hathaway for the movie, was The Hollywood Reporter.